Jeg kjøpte de 2 siste parene av denne klassikeren av importøren, utrolig bra høyttaler til prisen- så ikke gå glipp av denne sjansen, disse beviser tydelig at nyeste ikke alltid er bedre. I review loudspeakers of all shapes and sizes, but two-way, bookshelf models are my favorite. I don’t know if it’s sheer coincidence, or something inherent in this kind of design, but in my years of reviewing I’ve found more small two-ways that can provide the consumer with high performance and high value, provided that consumer is willing to sacrifice really low bass. Even the greatest two-way speakers can’t do super-deep bass, but they can get everything else right. So when Paradigm's new Reference Studio 10 came along, it was a natural for me to review. But there were other things that piqued my interest in this model. One was that the entire Studio v.5 series employs technology from Paradigm's top line, the Signature series. The other reason is that the 10 is a brand-new model. Previously, the Studio line began with the 20. There's still a 20 in the Studio v.5 line, for $1198 USD per pair. The new entry point is the Studio 10, which costs $798/pair. There are four "main" speaker models in the Studio line: the 10 and 20 bookshelf models, and the 60 and 100 floorstanders, which are quite a bit more expensive at $1998 and $2998/pair, respectively. Paradigm also offers an on-wall model called the Esprit, as well as four center-channel models (Esprit C, CC-490, CC-590, and CC-690), one surround model (ADP-590), and two subwoofers (Sub 12 and Sub 15). Paradigm usually creates a series of loudspeakers so that all the speakers in the line have the same build quality and cosmetics along with the same general sonic characteristics. When you move up the line, you usually get a bigger cabinet, along with more and/or larger drivers that provide higher output capability and deeper bass. Therefore, the small 10 should sound similar to the 20, 60, and 100, but won’t play as loudly or as low. The new v.5-series cabinets are quite special in looks and construction. Under the skin, they’re made of MDF and feel solid. Each Studio 10 measures 12"H x 8"W x 12"D and weighs about 17 pounds. The curved sidewalls, inspired by the Signature series, feature real-wood veneers of cherry or rosenut, or black. It wasn’t all that many years ago that you couldn’t find a speaker under $1000/pair that had a real-wood veneer, or a Paradigm speaker that wasn’t a hard-edged, pedestrian-looking, rectilinear box. But times have changed, and Paradigm has gone upscale with the Studio line’s beautifully finished wood, attractive curves, and very nice accents. The Studio 10 is equipped with a 1" G-PAL ferrofluid-cooled tweeter and a 5.5" S-PAL mid-woofer with a 1.5" voice-coil. Both drivers have diecast chassis replete with heatsinks, and a special mounting system that Paradigm calls IMS/Shock-Mount. Nor are these off-the-shelf drivers; Paradigm designed them specifically for the Studio line, using technology trickled down from the Signature series, and manufactures them in-house. The drivers are said to cross over at 2kHz with second-order electroacoustic slopes. Grilles are supplied to protect the drivers. In the past, Paradigm always recommended that the grilles be left on -- their speakers were designed to give the best response with the grilles in place -- but they say the Studio v.5 speakers should perform similarly whether the grilles are on or off. 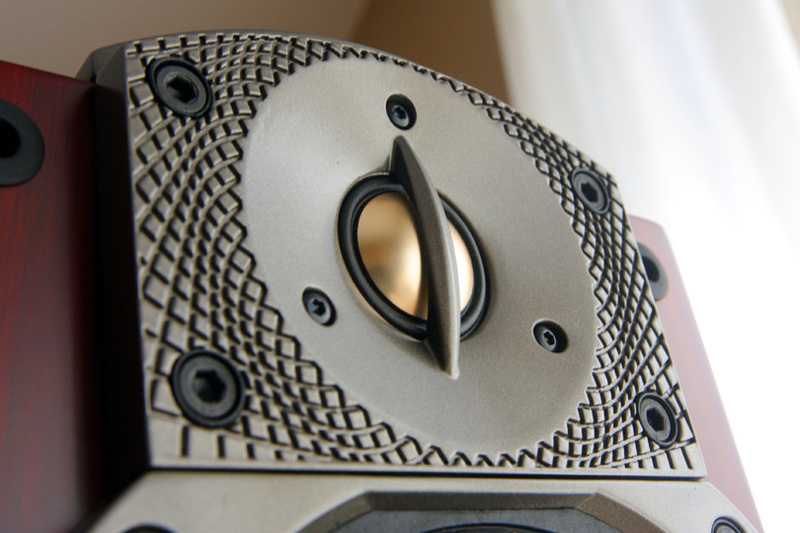 To augment the 10’s bass output, Paradigm has also developed an oval port, found just below the mid-woofer (all other Studio models have circular ports). On the rear are two sets of binding posts to permit biwiring. Paradigm claims the 10’s frequency response is 62Hz-22kHz, +/-2dB. The low-frequency extension is a claimed 37Hz, though that seems optimistic. From such a small speaker I expect reasonable output to only about 50Hz. If you want deep bass, real bass, buy one of the bigger floorstanding models or consider adding a subwoofer (see below). The Studio 10’s impedance is said to be 8 ohms and its anechoic sensitivity 86dB/W/m, which is par for the course for this type of design. The recommended range of amplification is 15-150W. See our Paradigm Reference Studio 10 v.5 photo gallery. I placed the Studio 10 v.5s atop 24"-high stands and drove them with a Classé Audio CAP-2100, a 100Wpc integrated amplifier. I had three digital sources on hand: a Simaudio Moon SuperNova CD player, a Stello CDT100/DA100 Signature transport and DAC, and an Oppo Digital DV-980H universal player. Interconnects were DH Labs White Lightning; the speaker wires came from Axiom Audio. This next sentence will make sense to some and sound odd to others: Because the best audio products have no real sonic character of their own, at first they might not sound all that special. Such was the case with the Studio 10. The speaker didn’t wow me right off the bat, but grew on me over time. For instance, when I first played the two-disc expanded edition of Billy Joel’s The Stranger (CD, Columbia/Legacy 88697 22581 2), a few things became apparent. Although the Studio 10’s bass was not super-deep in comparison to much larger speakers, it was much deeper and tighter than I ever expected from such a small cabinet. Its exceptionally clean midrange erred on the side of being a touch relaxed vs. being up-front and in my face. The highs were pristine. All told, the Studio 10 v.5 came across as a very refined-sounding speaker that was clearly fairly linear from top to bottom of the audioband: in a word, neutral. There was nothing colorful that screamed "Look at me!" To some, that might seem ho-hum, and they’ll walk on by. I believe that would be a mistake -- in any audio product, a lack of coloration is a very good thing. To clarify: Imagine a wall of televisions, on all of which the images look very natural. On one, however, the reds have been punched up. Initially, those reds will look impressive; they might even be what prompts you to buy the set, because it looks more vivid than the others. It’s unique, and therefore, at first, special. Over time, though, those emphasized reds will likely go from impressing to annoying you, because it becomes obvious that they’re not natural. Eventually you tire of the set, and wonder why you were so taken with it. This sort of thing happens all the time. The best TVs are those with the most natural image, even if it looks boring alongside some others, because that’s what remains pleasing to the eye over the long haul. Likewise, the best audio components are those whose sound is neutral and transparent, that don’t draw attention to themselves, that simply let the music flow through them. Which was precisely what the Studio 10 did. That’s not to say there’s nothing more to say about this model. It is, after all, a loudspeaker, and no two speakers, no matter how neutral and transparent each might be, sound exactly alike. Even the sounds of those with no obvious colorations at all have little sonic earmarks by which they can be told apart. The more I listened to the Studio 10 v.5, the more impressed I was with its bass. This was not only for the depth of bass achieved by such a small speaker -- there was solid output down to almost 40Hz in my room, much lower than I expected -- but because of the impact it could deliver even when pushed to high SPLs. Most small two-ways fall apart when pushed hard in the bass, and distort quite badly; the Studio 10 didn’t. I played plenty of hard rock, and was always impressed with the Studio 10’s punchiness and ability to retain its composure, even when the going got loud. So don’t be afraid to throw the most raucous, bass-heavy music you have at the Studio 10s. I did. They didn’t give truly full-range sound down to 20Hz, but they began to deliver from about an octave above that, and didn’t cry uncle even when I hammered lots of power into them. Furthermore, I suspect that if someone crosses a pair of 10s over to a good sub at, say, 60Hz (to give the 10s a little more breathing room; there’s no sense in crossing over at that overoptimistic claimed bottommost extension of 37Hz), I suspect they could achieve true full-range sound with high output capability for what is a very low price. What I also liked about the Studio 10 was its lack of upper-bass exaggeration and bloat. "When I See You," from Greg Keelor’s Gone (CD, WEA CD 17513), is a bass-heavy number with Keelor’s voice very close-miked. Plenty of the speakers I’ve heard, big and small, blur this recording in the upper bass and lower mids, and end up sounding chesty and coarse. But the Studio 10 stayed true to the source, and always precise. The 10 is a well-disciplined little loudspeaker. The 10’s mids had a clarity that used to be reserved for speakers costing at least twice as much. As a result, the smallest midrange details flew with ease from these speakers. Their tonal balance was also very close to neutral, but, if anything, there seemed to be a conscious effort on the designers’ part to make the midrange sound just a touch laid-back. I say "conscious" because most of the Paradigm speakers I’ve reviewed over the years have erred on the side of being a bit recessed rather than being too forward. This style of speaker voicing is hardly unique; the fairly expensive Harbeth Monitor 30 Domestic ($4995/pair), which I’ve just reviewed for SoundStage!, are also tuned this way. Some designers feel this sort of sound is easier on the ears over time, particularly since the ear is far more sensitive to midrange frequencies than to extreme low and high frequencies. It also has the advantage of taking the edge off harsh, overly aggressive recordings, and ease long-term listening to a wide variety of music. Paradigm’s Studio 10 and Harbeth’s Monitor 30 are two speakers that I can listen to all day long without getting ear fatigue. It’s also important to point out that the 10’s midrange cleanness remained intact at higher-than-normal SPLs, just as its bass did. This not only allowed the 10s to play loud, but to sound much bigger and livelier than I expected. I’ve become a big fan of Two Men with the Blues (CD, Blue Note 5 04454 2), a great-sounding live recording featuring Willie Nelson and Wynton Marsalis. I like to play it pretty loud because this recording can create the atmosphere of a live music event right in my listening room; it sounds as if I’m in a club. The Studio 10s sounded exceptionally well balanced playing this disc, laying out a large, well-defined soundstage of impressive width and depth and chock-full of detail. In fact, it sounded so spacious that, when I turned out the lights, it was easy to think I was listening to speakers a few times the 10’s size and price. And for $798/pair there was really nothing to criticize. The highs were super-extended, always clean, and well controlled. In fact, the 10s performed to so much higher a level than their price implies that I can’t help but think that people will end up comparing them to much more expensive speakers. If they do, one thing will probably jump out: the highs, while always clean and very refined, could come across as a touch dry. They were never coarse, and certainly not edgy, but they just didn’t sound quite as silky and sweet as the best dome tweeters out there, including Paradigm’s own beryllium dome in their Signature S1 v.2, a speaker that I reviewed on SoundStage! over a year ago and that costs about twice as much as the Studio 10. And to my ears, that’s where the 10 falls back a bit -- not for its price, but when it’s compared to speakers costing much more. Do I hold that against the Studio 10? Heck no. The Signature S1 v.2’s top end competes against speakers costing multiples of its price, so one also has to keep that in perspective. In addition, one has to realize that although there have been tremendous advances in speaker design over the years, two things still hold true: 1) While you can get impressive bass from a small speaker, you still can’t get super-deep bass from one; and 2) you can’t expect to get everything from a pair of speakers costing less than a grand. All told, a slightly dry top end from a speaker this inexpensive is minor compared to everything else it actually achieves. The Studio 10 v.5 more than justifies its asking price. 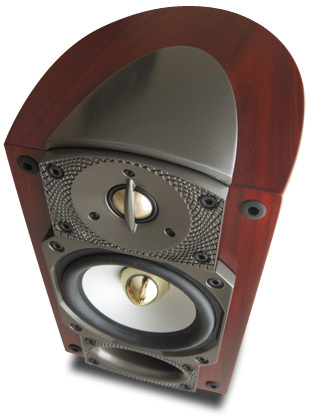 Von Schweikert Audio created quite a stir about six years ago when they introduced the VR-1 loudspeaker. I still have the original review pair here, in pristine condition. At that time, almost all small speakers costing less than $1000/pair came in vinyl-clad boxes, Paradigm’s included, and they looked pretty awful. The Chinese-built VR-1 ($995/pair) was still a basic box -- there were no curved side panels, not even rounded corners -- but it came in a variety of beautifully finished real-wood veneers that made the speaker look much more expensive than it was. The VR-1 also had a very refined sound, great bass for its size, and a relatively neutral overall balance. However, it did emphasize the mids just a touch, making it sound a little more "present" than relaxed. Six years later, the audio landscape has changed, and the Von Schweikert VR-1 is no longer the steal it once was. The Studio 10 v.5 is better in almost every way, and for less money. Instead of the VR-1’s presence in the mids, the Studio 10 is a touch laid-back in that region, but it has bass that’s as deep, highs that are more refined, and a clearer midrange. The Studio 10 v.5 can also play much louder without strain. The Paradigm’s build quality is every bit the equal of the Von Schweikert’s, and its overall appearance, particularly with its curved sidewalls and accents, is many times better. In audio as in sporting events, performance improves, records fall, and the bar is raised. In 2003, I said that the VR-1 was "a benchmark for two-ways in its price range." Today, that benchmark is set by the Paradigm Reference Studio 10 v.5. Paradigm has made a lot of two-way speakers over the years, but I believe that the Reference Studio 10 v.5 is the best affordable one yet. The build quality is excellent, the cosmetics are outstanding -- this is a far cry from the Paradigm of yore -- and the sound has not been compromised in any way for the sake of appearance. The 10’s excellent bass performance, as well as its ability to play loud, belie its price, and its evenhanded performance across the audioband will be appreciated by those who want their speakers to just step out of the way and keep the focus on the music. The Studio 10 v.5 likely won’t bowl you over with a flavor-of-the-month type of sound; rather, it will win you over gradually, if what you want is a natural-sounding speaker without obvious colorations that you can live with for a long time. I believe that two-way bookshelf speakers are the best at delivering high performance and high value -- and this speaker helps prove that. Paradigm’s Reference 10 v.5 is an affordable, welcome addition to their Studio line, and is now my top choice for a compact two-way loudspeaker costing under $1000/pair.